Indonesia’s martial arts action genre is booming and to capitalize on the boom, director Ifa Isfansyah unleashes some Indonesia wuxia pian with this film. Master Cempaka, an elderly female martial arts master known as the Golden Cane Warrior, had taken in four disciples. Merah Dara, Kala Biru, and Daya Gerhana were all children of rivals that Cempaka were forced to kill while the youngest disciple Angin, was abandoned. Cempaka, due to her ill health, has decided to find a successor to become the new Golden Cane Warrior. When she chooses Dara, this causes Biru and Gerhana to betray their master. When Cempaka sacrifices herself to save Dara and Angin, Biru and Gerhana convince both the Red Wing Warrior Chief and the High Council Chief that Dara and Angin have killed Cempaka to get the Golden Cane. Meanwhile, Dara and Angin are rescued by the mysterious Elang. Elang is a man of peace, having made a vow never to fight. Dara and Angin remember that to learn the ultimate technique of the Golden Cane, they must find the White Dragon Warrior. Meanwhile, Biru and Gerhana have made their plans known to take over the martial world by kidnapping Angin. When Dara is forced to give up the Golden Cane to save Angin, the young warrior is killed fighting the evil duo off. However, Dara soon learns a few things about the legend of the Golden Cane and she must convince the only one capable of helping her avenge Cempaka to break his oath. Indonesia’s martial arts action genre is truly on the rise thanks in part to films such as Merentau and The Raid films, even though the genre has been around for decades. Taking advantage of that genre, director Ifa Isfansyah brings up their entry in the wuxia pian subgenre with the help of three screenwriters alongside himself. The result is truly a nod to films such as The One-Armed Swordsman and Crouching Tiger, Hidden Dragon, in terms of a complementary mix of drama and martial arts action. While she is not in the film for long, Christine Hakim truly makes the most of her screen time as the elder Master Cempaka, who narrates the beginning of the film with a walk across the land to see various martial arts schools and informing us of her four disciples. The central role of Merah Dara is well played by Eva Celia. Dara is seen as one of the younger disciples who has a range of emotions from fear of not being worthy to avenger. Nicholas Saputra also does well as Elang, a man of peace who is forced to keep that peace because of a vow he took, yet it is clear he has a few tricks and secrets up his sleeve. Meanwhile, Reza Rahadian and Tara Basro showcase how devious they are as the antagonistic duo of Biru and Gerhana. What must stand out in a wuxia pian-style film is the action. While the norm seems to be bladed weapons, this film has the use of the staff as its central weapon. Renowned action director Xiong Xin-Xin choreographed the film’s action scenes, showcasing the dedication the cast went through in training for the film. Villain actor Rahadian took seven months of martial arts training for the role of Biru and breaks out well in the action. The rest of the cast look quite great with a minimal amount of wirework for more complicated acrobatic moves and impact shots. 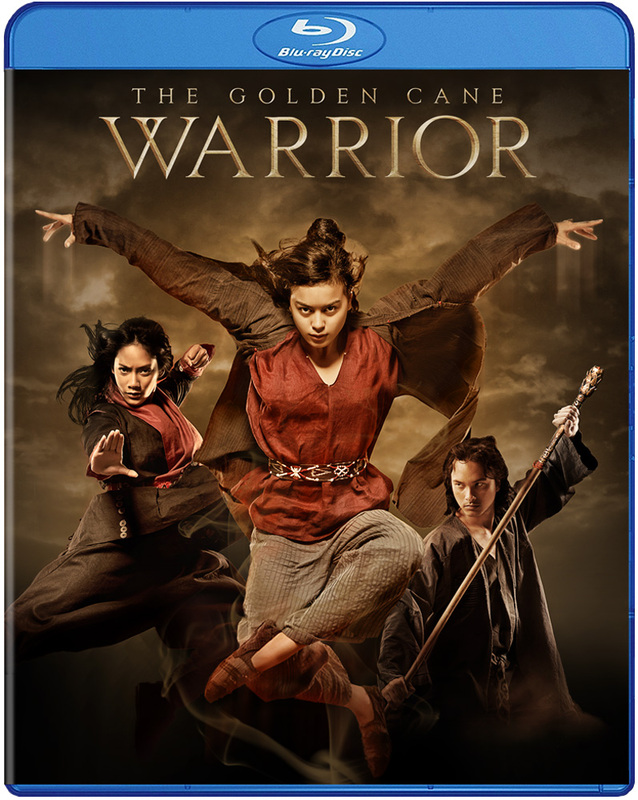 The Golden Cane Warrior, Indonesia’s entry of modern wuxia, is a very well made film that is driven by some really good performances, a well played-out mix of drama and exhilirating staff action courtesy of Xiong Xin-Xin. A Miles Films/KG Studio production. Director: Ifa Isfansyah. Producer: Mira Lesmana. Writers: Jujur Prananto, Mira Lesmana, Ifa Isfansyah, and Seno Gumira Ajidarma. Cinematography: Gunnar Nimpuno. Editing: W. Ichwandiardono. Cast: Eva Celia, Nicholas Saputra, Reza Rahadian, Tara Basro, Aria Kusumah, Christine Hakim, Darius Sinatharya, Whani Darmawan.